Don’t ask me how I did it, and Thank you God, it didn’t need stitches! Last Friday night, I was out in the garage cutting boxes with a box cutter, to fit into our recycle bin. I was just about finished when I look down and notice blood, which immediately started to run down my hand and drip on the floor. Somehow I managed to get into the house, while still holding onto the device that had just sliced through my thumb. He steers me into the bathroom when I begin ranting of really needing to lie down (before I fall down). He proceeds to use hydrogen peroxide to clean out the cut for a better look. He mentions stitches sometime after the screaming stops and I begin my ranting of really needing to lie down. He tells me to sit on the toilet lid. By now, I have a toddler staring at me, with eyes larger then the moon and a dog that feels the need to sit on my lap of all places! Gino mentions again the need for stitches if the cut doesn’t stop bleeding. He wraps it with gauze and I somehow make it out to the living room floor where I finally lie down. The next morning, we pull off the bandage, when the cut begins to bleed again. We decide to head over to the Care Clinic; the doctor checks my thumb. Luckily, I didn’t need stitches but I did need to get a tetanus shot. 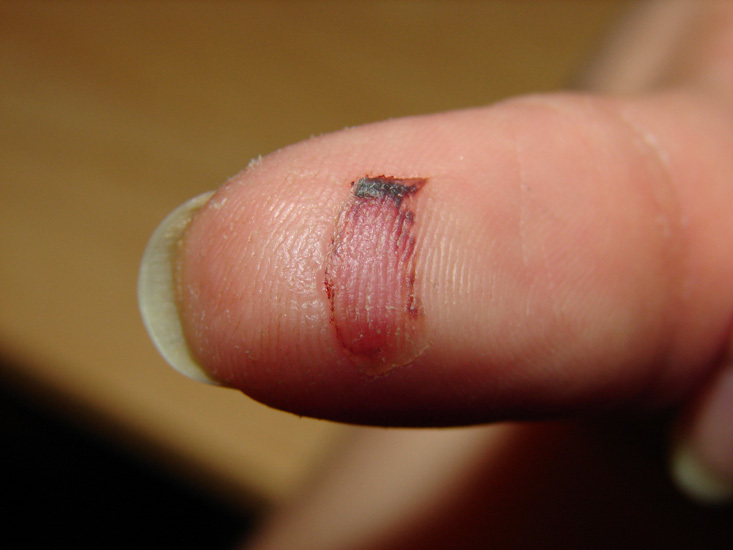 That I could handle… sort of, better then stitches… just imagine if I had cut my thumb off! Wow, 5 years old, but we all know you’re still a puppy at heart. 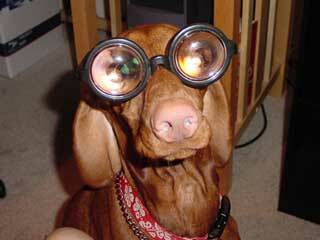 Also, we’ll really try to get you some contacts this year. We had a (very rare) sun shiny day today! Actually, we have had a few sunny days the past several days…don’t get to excited though; we are supposed to be back to normal rainy weather tomorrow. Oh, I can’t wait for summer! Anywho, we spent the early afternoon, up at our little community park. Isabel had a blast! There is a toddler slide/gym and an older kid’s slide/gym (no swings). When we arrived at the park there were some older kids that were a bit rowdy with their game of “tag” but did keep out of Isabel’s way and we stayed clear of them. 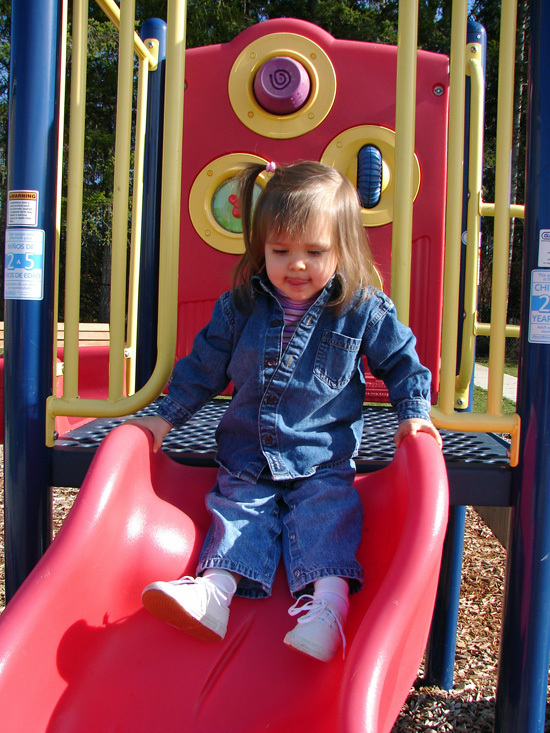 Getting ready to head down the slide! Neighbor’s dog. Seemed friendly but we didn’t touch. 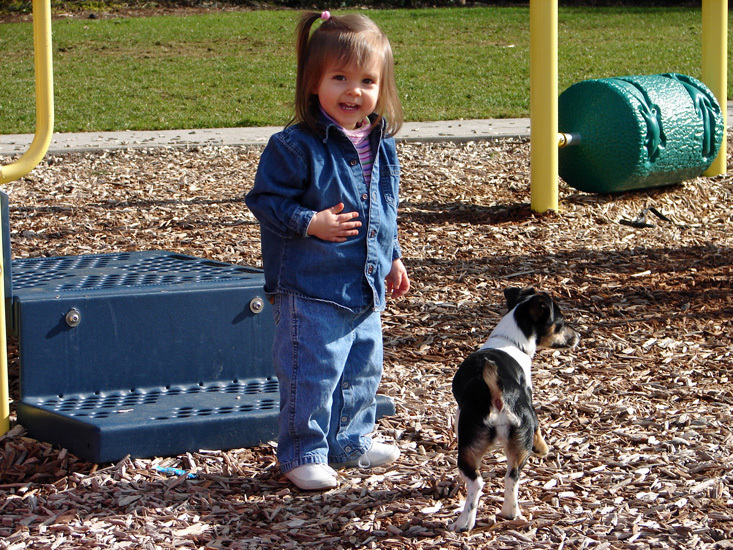 One of the girls, that was at the park, had brought along her little dog with her. Isabel had wanted to pet him/her so much! We even found a ball, that I believe had been left by someone prior to us using it. Isabel wanted to play “fetch” with the little dog but the dog was too small and the ball was too big. 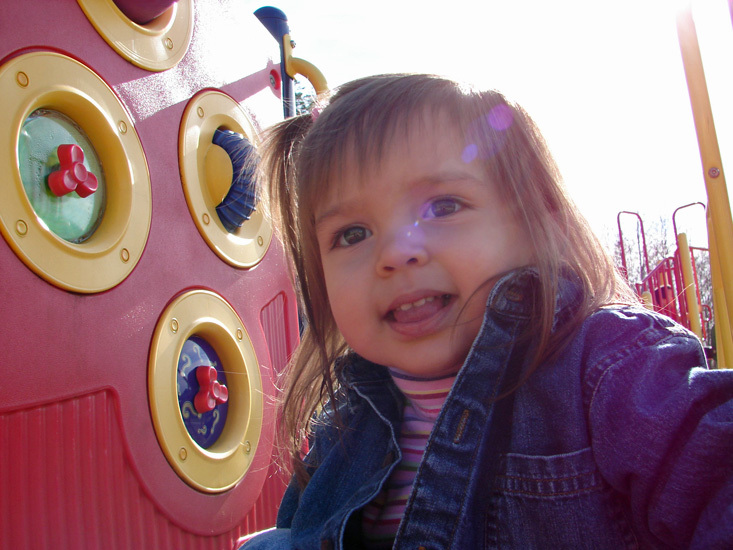 We played a few rounds of “catch” until Isabel got distracted and went back to the slides. She’s got that tongue working! Isabel did rather well going up the stairs and down the slide. 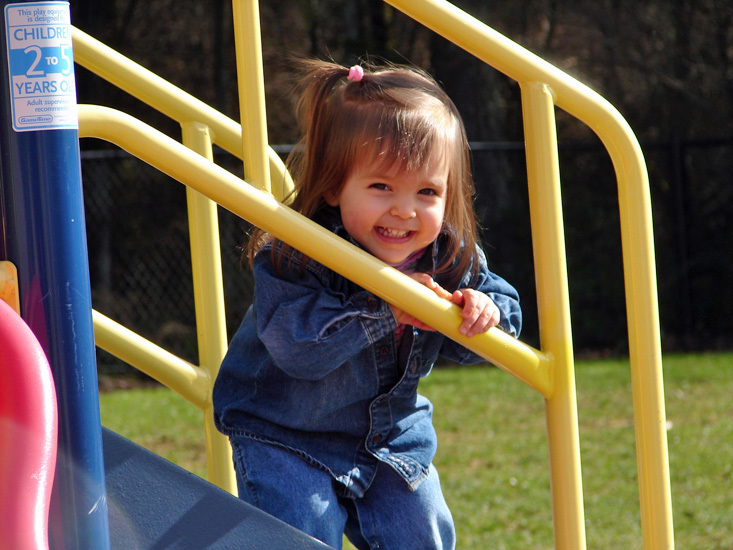 I did notice that she would watch the other kids and see them walk up the slide and jump down from the top. I believe she wanted to try this! A few times she had me worried but I would remind her to sit and she would do so without protest. 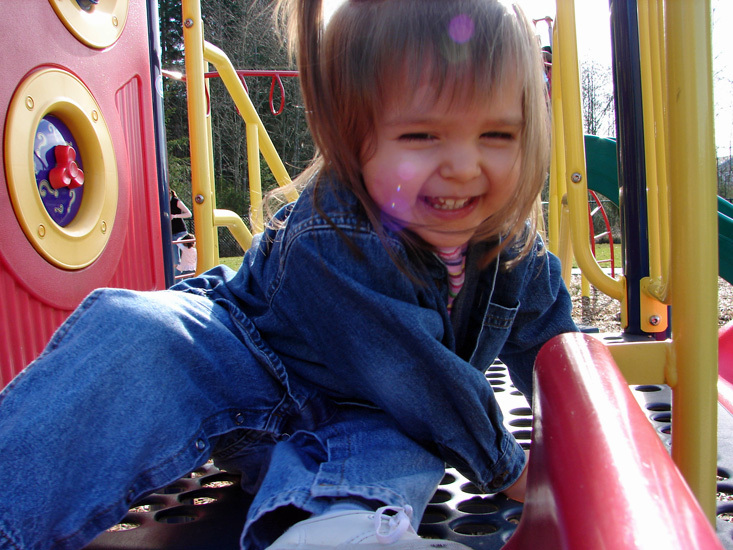 Sunny days at the park! It was a rather fun time during our sunny day weather! We are back at home and as I’m typing this the clouds have already begun to move in and take up residence in the skies over head. I have to remind myself that by Easter it should be clear skies again…ya right. Yesterday, I noticed Isabel was walking around the house with her butter dish and measuring spoon from her kitchen set. 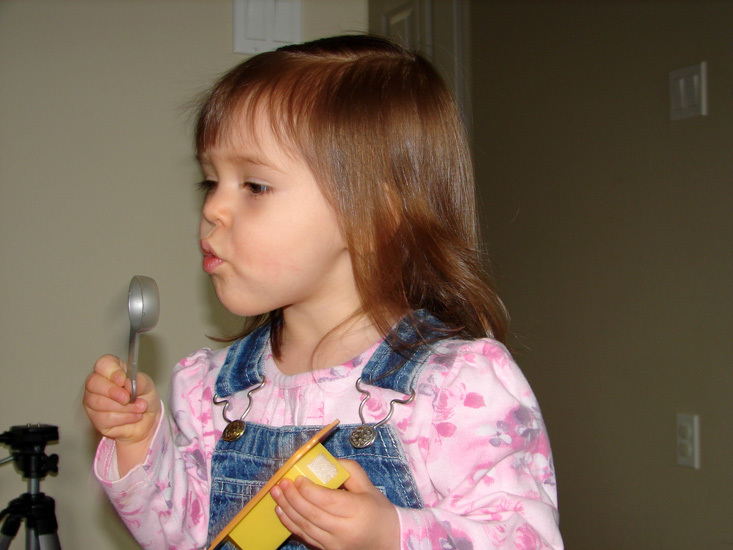 She would swoosh the measuring spoon in the upside down butter dish and then put the spoon to her lips and pretend to blow. I was shocked and amazed that she remembers what bubbles are! Last summer, I only blew bubbles with her outside twice that I can remember. What a little smarty! Her little mind just amazes me every day! Project “WoodChuck” is in full swing. I’ve been working tirelessly through nights and weekends trying to finish the woodworking shop at the new house. So far the only things I can check off the list is electrical and insulation. Drywall is about 40% finished and I’m hoping to have the rear door framed out and installed this weekend. It’s coming together… slowly, but surely. Once complete I have a long list of projects including a kitchen island, table and chairs for Isabel, and cabinets for the laundry room. Over the next few months I’ll be working to post past woodworking projects on my personal blog (http://blog.gspin.com/). This is Isabel’s friend Jimmy. His mommy Val, works with Gino. 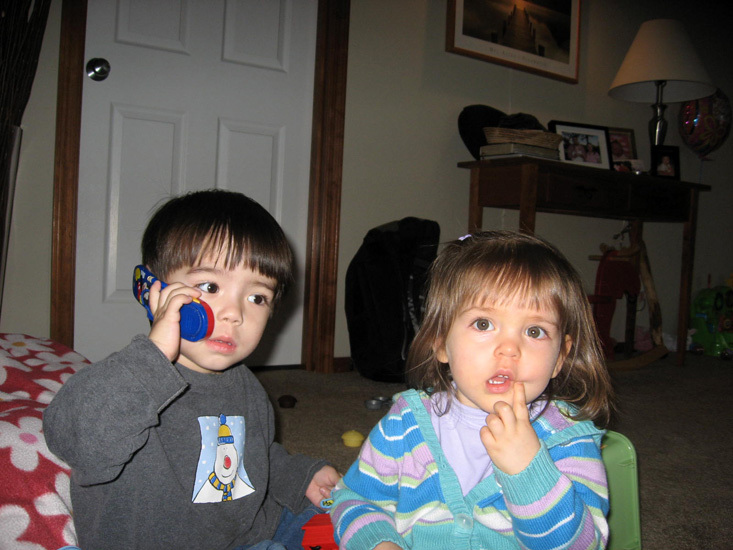 Jimmy is 5 days older then Isabel. We don’t get to see them very often (that might change!) but they were in the neighborhood this weekend to view some of the new homes in our community. Afterward, they came to our house for a visit and then we went out to lunch with them and some other friends (that work with Gino also) that already live in the area. 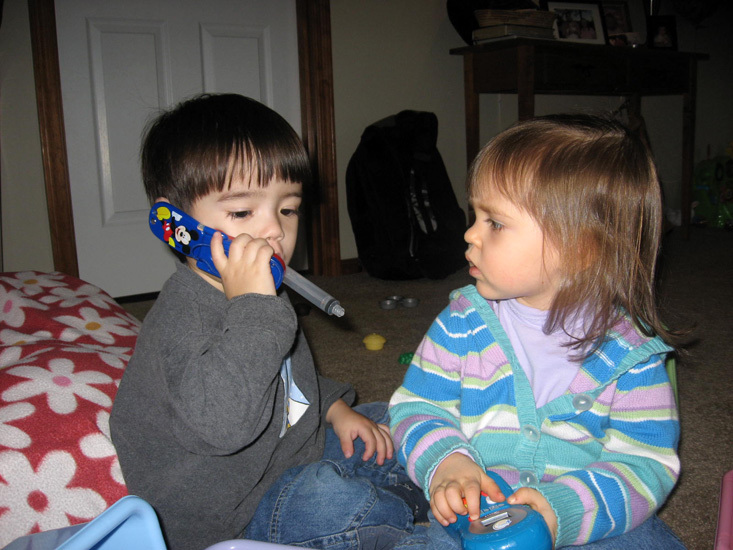 These two were “talking” on the phone with each other. Isabel’s “first” real birthday party was a big celebration at home with just the three of us and Daisy too. 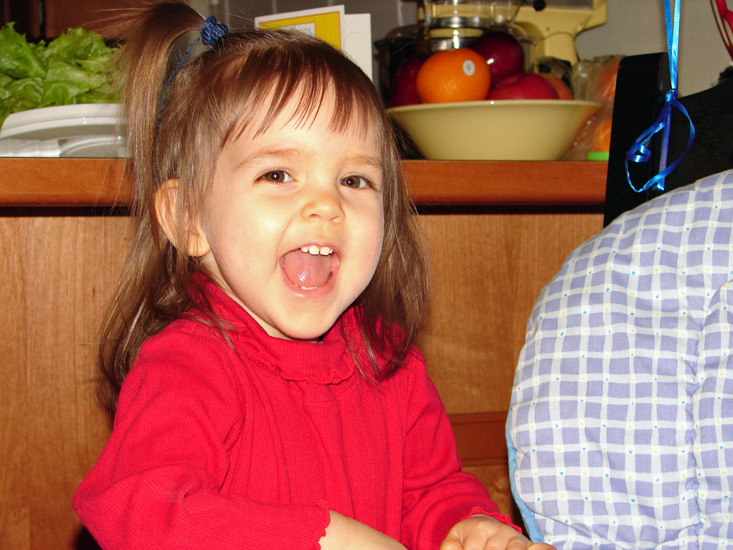 In the early part of the day, Isabel and I spent time goofing around the house and during Isabel’s nap time, I began to get the party started. I blew up balloons (her favorite) and taped streamers to the wall, low enough for her to actually see them and understand that it was a special day. I had wrapped all her gifts the night before and placed them on the table in pile as a sort of center piece. 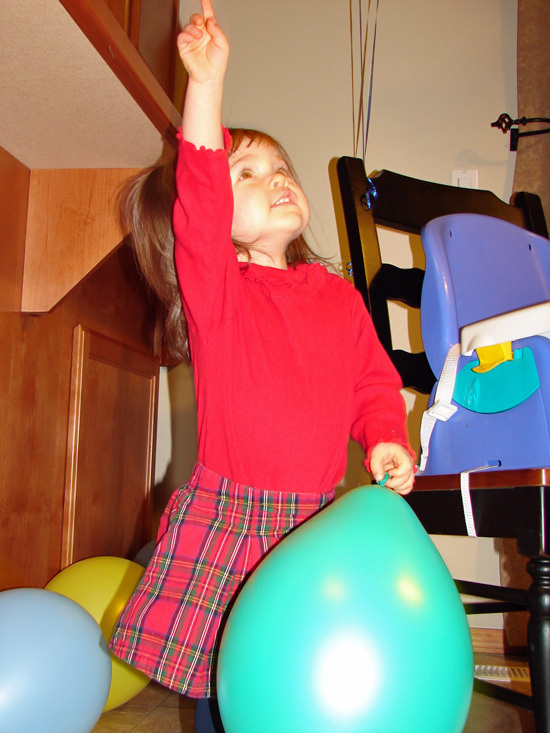 Pointing to the streamers and balloons! When she awoke from her nap and I brought her downstairs, the first thing she noticed was the streamers followed by the many balloons attached to the walls and thrown all over the floor. We goofed around with the balloons, while I was making dinner, which was all of Isabel’s favorite foods; spaghetti w/meatballs and toast! Her birthday dinner; spaghetti with meatballs, a side salad and toast! 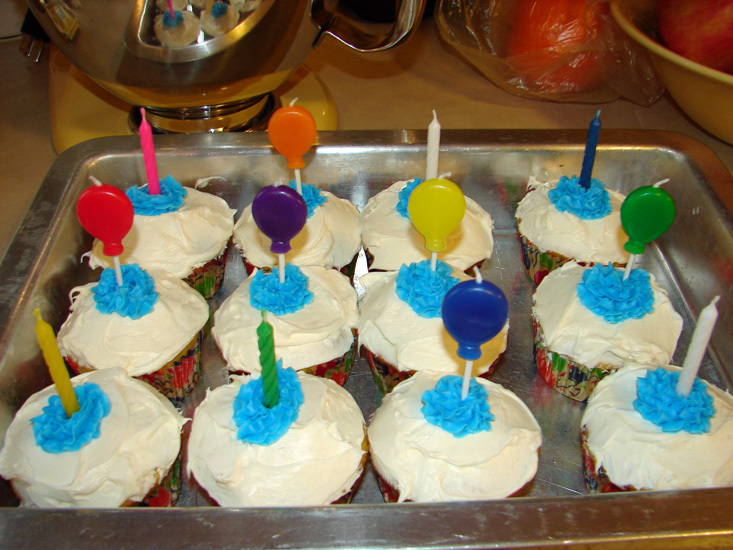 After dinner we sang “Happy Birthday” and ate cupcakes, that I decorated with balloons and candles. Gino and I blew out the candles since Isabel seemed a little frightened by them. Halfway through the cupcakes, I realized that I forgot the ice cream! 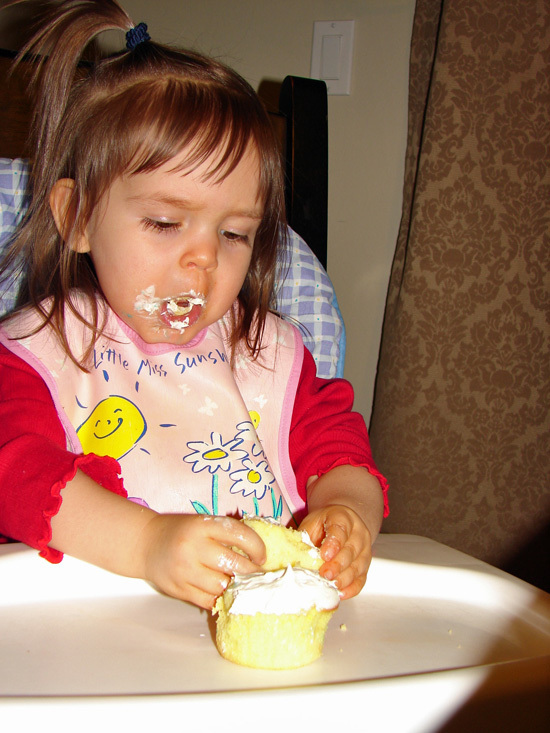 Isabel liked the frosting and ice cream best; she didn’t eat the actual cupcake. Silly girl! Finally, we let her open her presents from Mommy and Daddy. 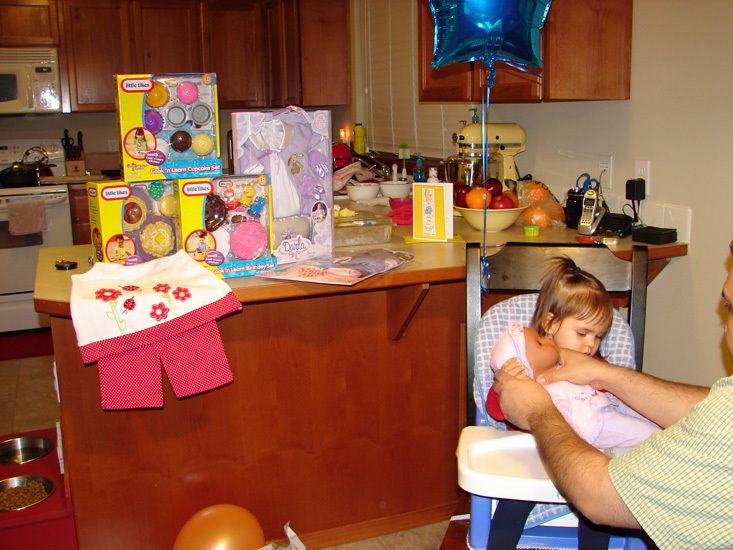 She received items for her kitchen that she got at Christmas time, a summer outfit, and a new baby doll named Darla. Her birthday gifts from Mommy and Daddy. Happy Birthday – Isabel! We thank God every day for your recovery and continued health from your 1st birthday. You deserve it! 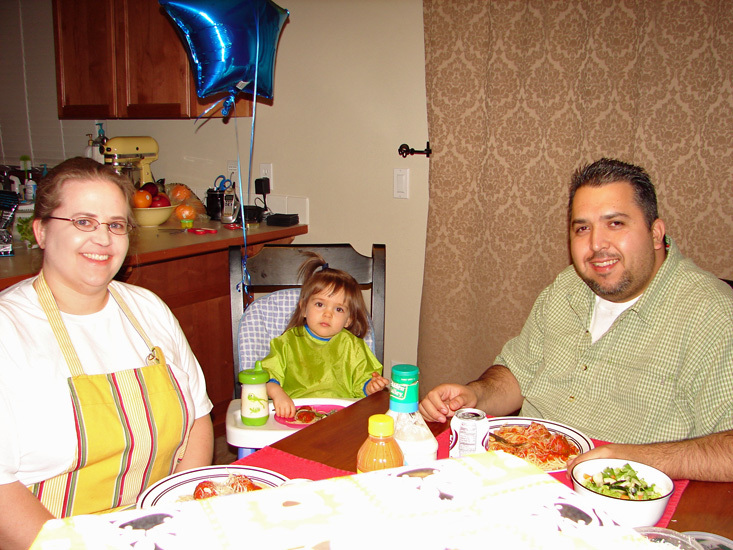 Welcome to the Espinoza family blog. This site was created with the hope of giving all our family and friends a small glimpse into our humble little lives. Going forward you will be sure to find family updates, pictures, videos, rants-n-raves, and maybe even a little rambling. All in all we’ll try our best to keep you engaged and entertained. We look forward to your feedback and comments, so please chime-in and stop back often.